Author and Writer Friends, as well as friends who have always dreamed of writing, do you need another how-to book? I started my writing journey with joy and excitement. And I have to say, my book loving life has blessed me. But, all it takes is for someone to stop me at the grocery store and ask me how my books are doing, and my little seed of doubt sprouts another leaf. How AM I doing? My friend Pauline Wiles has created the book that I need in my creative life right now. I will let her tell you about Indie at Ease and then I’ll share some more about what I’ve learned from her calming and informative pages. And there’s an EASY EBOOK GIVEAWAY, too! Keep READING! Know yourself and your unique writing style. Set authentic, long-term writing goals. Nurture your creativity and protect your well-being. Maximize your energy and work at a pace you can sustain. Limit your marketing to what really works. Prioritize key tasks and ignore distractions. Dodge the most common pitfalls for independent authors. Contributions and advice from over a dozen experienced indie authors. Bonus resources: checklists, templates, and trackers to jump start your daily routine. Indie with Ease is your essential guide to well-being, productivity and serenity as an indie author. Keep Reading- You’re Almost to the Giveaway! Pauline emailed me and told me about Indie with Ease and she asked if I wanted a copy. YES! As soon as it zoomed into my kindle, I began to read it. And I’ve been highlighting so many nuggets and gems. I haven’t finished the book, so, this isn’t a full review, but here are some of the treasures I’ve found. More about Pauline Wiles: British by birth, Pauline is now a contented resident of California, although she admits to occasional yearnings for afternoon tea and historic homes. Her debut novel, Saving Saffron Sweeting, reached the quarter final of the Amazon Breakthrough Novel Award and was a number one Kindle Best Seller. The stand-alone prequel, Secrets in the Sky, was reviewed by Publishers Weekly as ‘an enticing read’. Sweet Pursuits is the third book in the series. Pauline has also released a free book of short stories, along with Indie With Ease, aimed at helping other self-published authors reduce stress and boost productivity. Ready to be more at ease with your writing career? 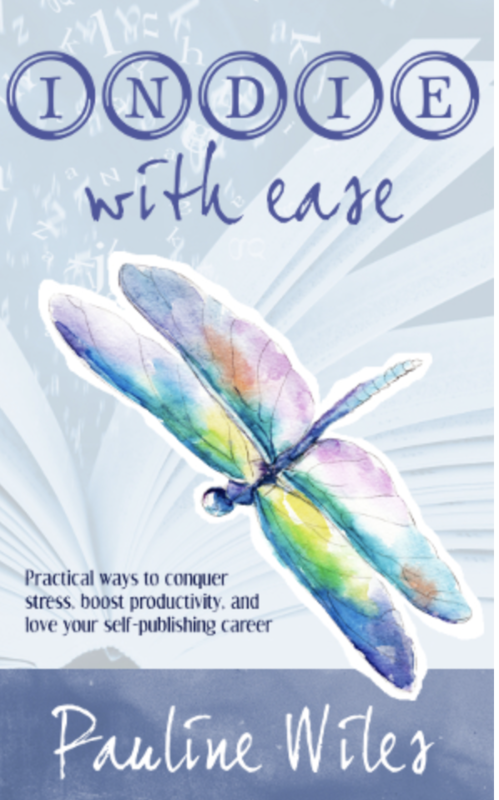 Author Pauline Wiles has generously offered to give away several ebook copies of Indie with Ease. Squee! (first time I’ve used that word in a blog) Please connect with Pauline and me by leaving a comment along with either your email address or a social media account where we can obtain it. I’ll choose some winners! Well…we’re all winners…but some of you will be receiving a free ebook!! Thanks for featuring the book, Jena! I’m so glad you’re finding it useful so far. And yes, that grocery store question about our books can certainly upset our emotional apple cart! Thank you Pauline! I promise to keep gliding through the grocery store. All the best to you! Hi Jenna and Pauline. That sounds like just the book I need right now. I’d be so happy if you were to squeeze even a tiny bit of benefit from the book, Judith. But hopefully you’d get lots from it. Thanks Judith- yes, Pauline has sound advice and she conveys it in such a pleasant and positive way!